Lakshyadeep Toppo of Pathargaon in Jashpur district of Chhattisgarh lives with his mother and elder brother. His mother is an Anganwadi worker and his brother is a driver. The family income is limited and for a long time Lakshyadeep wanted to support the family but opportunities were limited. However, he got a chance to fulfil his aspiration soon. Lakshyadeep came to know about the Chhattisgarh Government’s initiative called Livelihood College which imparts skill education to youths. He was also told that every district of the state has one Livelihood College. 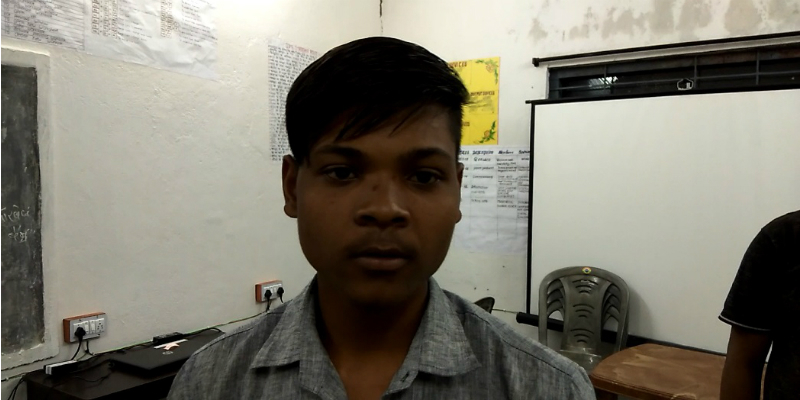 Lakshyadeep went to the Livelihood College in Jashpur and looked into various options regarding courses available there. All the courses are designed keeping in mind the needs of various industries. The youths from various parts of the state can opt for these courses and they also get counselling to help them take a decision on the best suitable course for them. The students get accommodation facilities as well free study materials. After completion of the course they also get placement assistance. Among all the courses offered at the Livelihood College, Lakshyadeep found the course on Showroom Host/Hostess most suitable for him. He enrolled himself in the course and started to learn the various aspects of becoming an efficient showroom host or hostess. “I learnt how to talk to customers and present a positive image of the products available in the showroom. I have seen a major improvement in my personality. My confidence level has also increased significantly. “ He says. Lakshyadeep has recently been selected for a job at a car showroom. He is elated about his job and the future prospects. “I am hopeful of a great future. I am highly confident that I will achieve much more in the coming days. Whatever I learnt during this course has made it possible for me to get this job. Without this training I would have never been able to achieve anything. I would encourage others to benefit from the opportunities provided by the Livelihood College. This can change the lives of many young boys and girls.” He says. He is also happy that he will now be able to support his family instead of taking help from his mother and brother. The Livelihood College has helped a lot of young men and women turn their dreams into reality. The government of India has put a lot of emphasis on skill development to turn India into a global supplier of skilled manpower. The Prime Minister’s vision to equip Indian youths with advanced skills related to various industries to make them the most sought after human resources around the world is the driving force behind the Skill India initiative in the country. The Chhattisgarh Government has taken forward this vision with various initiatives like Livelihood College. The Livelihood College has been one of the most popular initiatives in this regard. The Livelihood Colleges are set up in every district of the state and they have been serving as the centres for honing the skills of the youth and help them transform their lives.